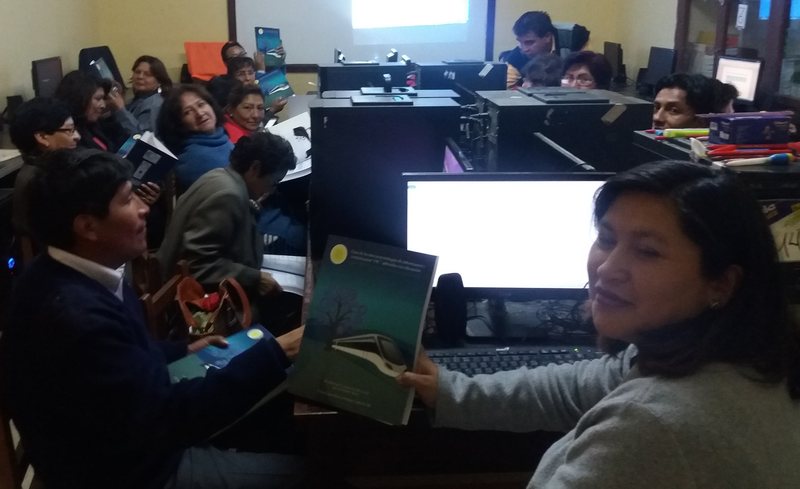 This project builds on the successes from the previously supported Pilot Project for the implementation of Information and Communication Technologies (ICTs) in three Public Educational Units of La Paz municipality. The new project is a private-public partnership that covers 30 public schools in low resource setting and targets 570 teachers. It is co-funded by the Ministry of Education in Bolivia, Computer Labs Municipality of La Paz, ENTEL and Fundacion La Paz. Classrooms in public schools have been furnished with computers, but teachers are still using the blackboard and chalk. Teachers do not have the experience and/or time to integrate the computers in their teaching. This teacher training project will strengthen teacher capability to integrate ICTs in their teaching to enhance student learning. Teachers will learn how to use the computers by integrating them in their teaching. Fundacion La Paz will update and use existing modules from the first project. The computers used have a technological platform that is aligned to the policy of the Ministry of Education and teachers will be trained to develop new modules that they can integrate in this platform. After the training teachers will create apps in their respective subjects to increase learning outcomes among the students. An educational web platform will be deployed to allow communication and interaction of the teachers. Fundacion La Paz, is a non-profit organization with the objective of designing and implementing programs and projects for the benefit of the poor population of suburban and rural areas of Bolivia. It has focused its work in two areas: advancement of women and strengthening educational partners.